On January 16, the U.S. Food and Drug Administration (FDA) Bone, Reproductive and Urologic Drugs Advisory Committee (BRUDAC) convened to review the safety and efficacy data from the pivotal Phase 3 studies for EVENITY™ (romosozumab). Eighteen of 19 BRUDAC members voted in favor of recommending approval of a biologics license application for the monoclonal antibody romosozumab for the treatment of osteoporosis in postmenopausal women at high risk for fracture, with two of 18 “yes” votes supporting a different indication for the drug. In its discussion, the Committee emphasized the need for post-marketing follow-up. In committee discussions both before and after the vote, panel members unanimously called for additional data regarding the cardiovascular safety of romosozumab (EVENITY™, Amgen), with most members supporting either a randomized controlled trial or an observational study conducted after approval. While the FDA is not bound by the Advisory Committee's recommendations, it takes the committee’s advice into consideration when making its final decision. Deadline Approaching: Apply Now for ASBMR’s Network of Minority Health Research Investigators (NMRI) Annual Workshop Travel Grant! ASBMR recognizes the need to support research investigators from traditionally under-served communities. ASBMR is partnering with the Network of Minority Health Research Investigators (NMRI) Annual Workshop to provide a $1,500 travel grant to send an early career investigator to attend this event. The major objective of NMRI and its annual workshop is to encourage and facilitate participation of members of underrepresented population groups and others interested in minority health in the conduct of biomedical research in the fields of diabetes, endocrinology, metabolism, digestive diseases, nutrition, kidney, urologic and hematologic diseases. A second objective is to encourage and enhance the potential of investigators in choosing a biomedical research career in these fields. To find out if you qualify and to begin the application, click here. The deadline to apply is Monday, February 19th. 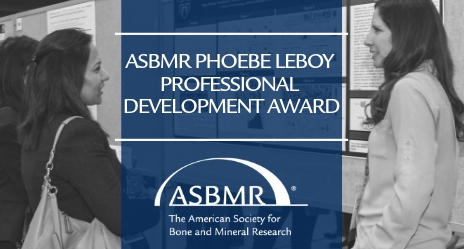 The ASBMR Women’s in Bone and Mineral Research Committee is asking for nominations for the two new FASEB Excellence in Science Awards in the Mid-Career Investigator and Early-Career Investigator categories. These awards are given in recognition of outstanding achievement by women in biological science. Award recipients will be expected to present an Excellence in Science Award Lecture at the annual meeting of a FASEB Member Society. Presentation of the award will take place in conjunction with the lecture. In addition to the unrestricted research grant, the award covers the recipients’ travel to/from the meeting, hotel expenses, complimentary meeting registration, and a plaque in recognition of the awardee’s achievement. Click here for more information. Please send your suggested nominations with a copy of a current CV or Biosketch to asbmr@asbmr.org. FASEB will also be hosting a free webinar next Thursday, January 24th, 2019 titled "FASEB's Excellence in Science Award: Nomination Process & New Opportunities for 2020". This webinar will review the eligibility requirements, application process, and deadlines for the 2020 awards.The presentation will also address frequently asked questions regarding the nomination submission process. Please note that registration is required for this event, and can be found here.